I had mine already delivered and for the first time ever actually came with a bad dent on the cover. Had to go to the store and they were able to just swap it with a pristine one. They had 29 so I'm certain there will be plenty day one. What were the other ps4 selects, I only saw blood borne. Ralph will be decently stocked in stores. Cap and Mermaid are going to be very limited. Can anyone comment if AC7 is worth $40 (after GCU) or is this a title that I should wait until it hits $29.99 to grab? I've never really played any of the Ace Combat games but by all accounts the graphics are gorgeous on this one, with lots of different planes and stuff. Just torn. Especially with DMC5, TD2, etc coming out soon. If you're torn, just say no. I like it. Definitely a cool change of pace. Gave me a nice arcade feel. Now as for if it's worth $40. I'd say yes but that's me. Everything is a better at a lower price. You say there are other things you are looking forward to so waiting may backfire. If you have 49 bucks it's a good play if the videos intruige you, I say go for it. Those Disney steelbook editions are available for pickup order now. I know Jesse Cox said he's been playing a lot. Not using that as an endorsement as much as someone you can watch videos of gameplay from someone that's put in some time with the game. Glad the Marvel 4k are starting to show, shame not starting with one I'd buy. I may look into getting a code. I almost missed this. I didn't start collecting the steelbooks until Winter Soldier so I'm trying to backfill without spending like $70-$100 on the original versions on ebay. 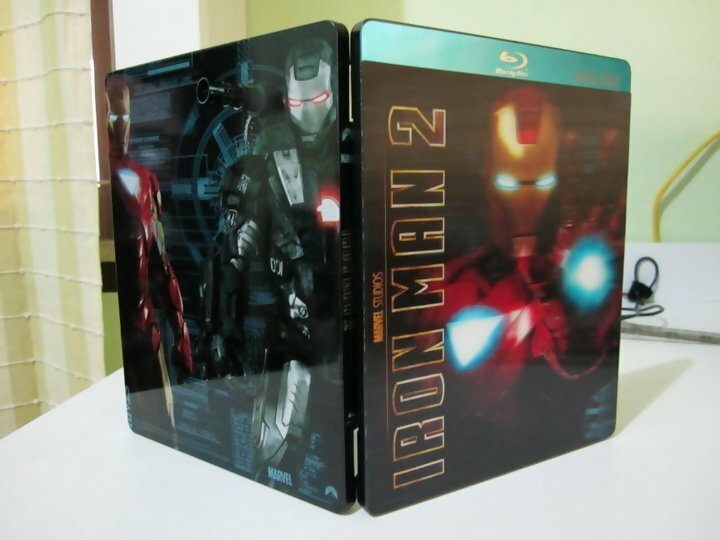 I found a reasonably priced Iron Man one from Germany, so with this one I just need the first two Thor films and Iron Man 2 and 3. To continue the GCU convo, now that it is dead I pretty much only buy the Marvel steelbooks from Best Buy. To my knowledge, they didn't start the US steelbooks (and they've all been Best Buy) until Thor 2. They've since gone back and done Avengers 1 and now Cap 1 for the 4K releases, and there was (might still be) an Incredible Hulk steelbook floating around from the old studio that produced it. I think that just leaves the Iron Man trilogy, and the first Thor. Maybe they'll do those eventually and I can have a complete Marvel steelbook set... that would be nice. yep, just looked it up target exclusive. Metalpak i guess is what they are called. Just searched for the case and found this vid from 2011 showing off all the ones this guy had from around the world. Skip to 4:20ish for the Target cover I have. In bestbuy terms. They updated on 2/5/2019. For rewards program. I just find it funny. Do they think that will stop people. I'm not a reseller, I'm a collector. A collector that happens to sell most everything I own after I realize I collected too much, and then I start the cycle again. Hoping Gamestop follows suit and offers a $10 bonus for pre-ordering these. Since my GCU expired I've been mostly buying games at Gamestop since I still have Elite Pro and there is a store less than a mile from my house. Went into Best Buy yesterday and saw at least 4 different games I would have bought if I still had GCU. I left the store without buying anything. I've noticed I havent been buying as many games since GCU ended myself. Altho I have been placing pre orders on my girlfriends account since hers is up in april. Maybe GCU ending is a good thing, I'll spend less cuz I'll buy less games. It's funny how many CAGers quit amazon after they dropped their 20% discounts. When my GCU eventually runs out I may just simmer down and slowly stop buying games in general. I'm tired of games today that released half assed, broken, or incomplete, to be patches 6 months to 12 months later and sold as half price as a "COMPLETE EDITION". Pssh, true CAGs quit Amazon after their 30% discounts ended. Didn’t someone recently order a game, picked it up in store and the manager etc opened the game right there in front of them? I do remember someone posting that.. I rarely used the 20% discount with Prime since I had GCU, but wish they offered it now. I order from Amazon often but rarely is it video games. I agree. Gamestop also has a solid rewards system and tend to carry a lot of games that Best Buy does not have. I also feel like I need to enjoy a retailer for video games for as long as I can since they likely won't around too much longer. but that hasn't happened to me, or I'd no longer shop at that store. I'm one of the few who doesn't have a shady gamestop anywhere around me. Nice workers at the ones I go to. The only time that has ever happened to me is when I had a defective disc and had to do a return/exchange for a new copy.